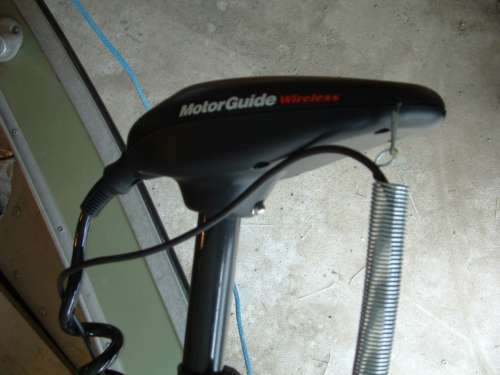 With the Motorguide Wireless Trolling motor, the design makes it a challenge to mount an external transducer. The stow-away locking arms invite the transducer cable to numerous ways to become entangled. MG recommends one of their models w/internal transducer. After some mock-ups decided on a unique way to prevent wire entanglement. Pictures with some explaination are posted here, to generate ideas for others. I will report back at the end of the season on how well it worked. The main idea of the design is to use a spring to keep slight tension on the cable, such that it will clear all of the catch points. Also it is very forgiving when the motor has been turned to large radiuses. Starting right from the transducer, you have to be careful to clear stow-away arms. This is held in place with a wire tie and a stainless steel hose clamp. Cable positioning at the front right corner is performed with tightly applied electrical tape and SS hse clamp. SS clamp is covered in tape. 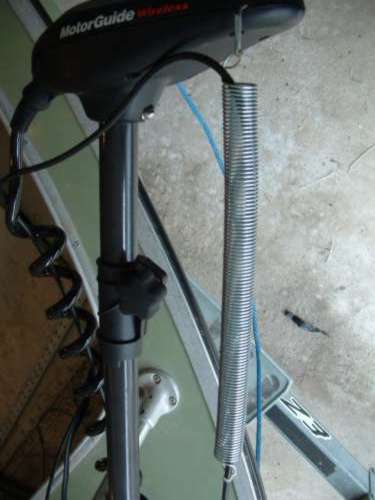 The corner was choosen to have maximum turning radius before cable contact with edge of the boat. 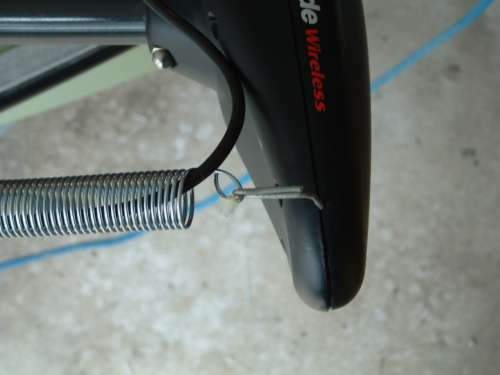 Transducer wire is run up through the spring. The spring is only slightly streached and clamped to the wire with a tight wire tie. Notice slack in wire in the deployed position. 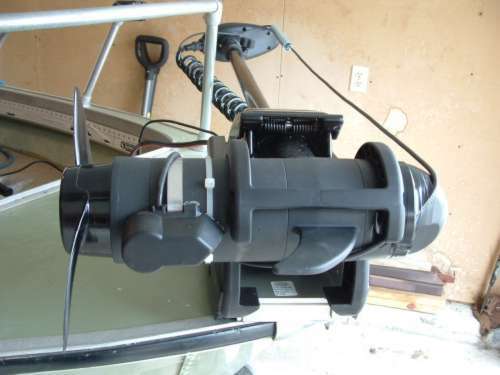 This allows for the spring to streach if the motor is inadvetantly rotated too far. Slack is set by the routing of the cable in the stowed position. A heavy wire clip is attached to the nose of the directional head. Transducer wire is run through the coiled spirel of the power cable. This shows the stowed position with minimum slack. Transducer wire is anchored to the base of the power cable with two wire ties. From here it goes to the depthfinder display head. UPDATE: I have over two seasons with this set-up. The elecrical tape on the nose had to be touched up after a season of use. 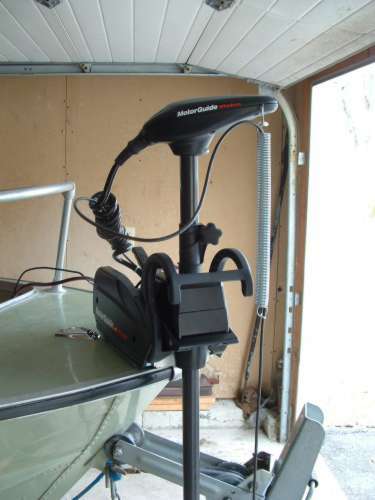 I have wrapped the trolling motor over 360 degrees a few time by sitting on the remote. 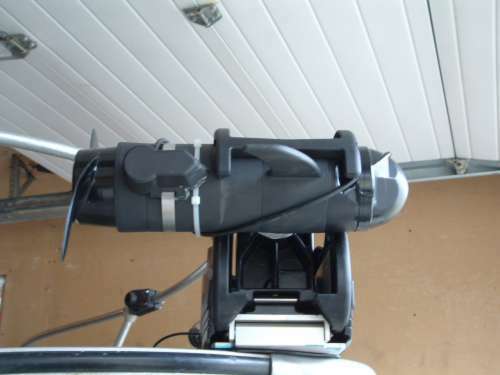 That has not caused any damage to trolling motor, transducer, or transducer cable. One minor issue occurs when motor is set for deeper running. 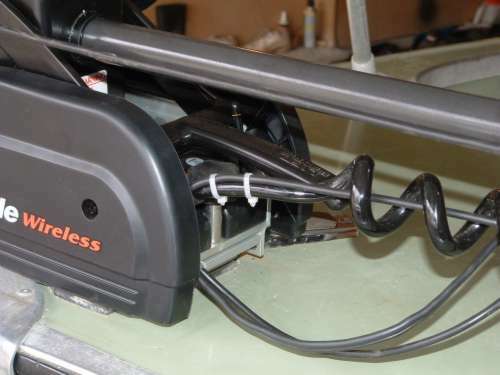 When trolling motor is pointed straight ahead, spring can vibrate against front holding arm. A small piece of adheasive foam on arm would dampen any noise. Because the MG Wireless is portable it makes removing the transducer conector from the Humminbird tilt/swivel mount a slight pain. I have dropped and lost a couple of screws over the years. I plan to add a transducer switch to this front station, so I can use trolling motor transducer or old unused 3-beam on back of transom. 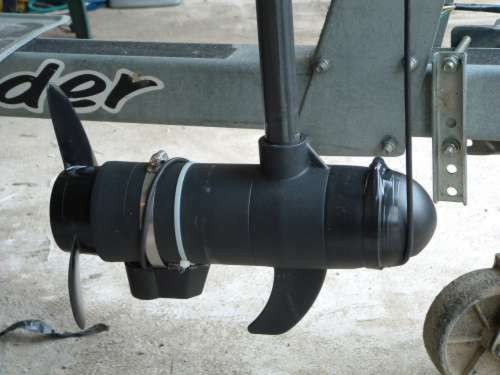 The switch connector will allow for easy cable removal (plug/unplug) when removing trolling motor.